This article is about integrating spring boot with hibernate. Here, we will be using spring boot and hibernate 5 configurations. We will be creating sample spring boot hibernate example having some rest endpoints exposed through spring controller. The dao class will have sessionFactory injected which will be used to create hibernate session and connect to database. We will be using mysql database.Let&apos;s get started. Following is the project structure. We have controllers, service and dao layers. We have application.properties defined that contains configurations related to our datasource. The main() method uses Spring Boot SpringApplication.run() method to launch an application. The most convenient way to define datasource parameters in spring boot application is to make use of application.properties file. Following is our sample application.properties. Here we are using JPA based configurations and hibernate as a JPA provider. The following configuration creates a DriverManagerDataSource which opens and closes a connection to the database when needed.It means no connection pooling is achieved.While doing so, you may have performance issues in the production. In production, it is always recommended to have datasource that supports connection pooling and to create this connection pooling datasource we require to configure custom datasource bean programatically. We will create it in next section. While writing this article, the latest version of spring boot was 1.5.After the release of Spring Boot 2.0, the default datasource has ben chnaged to Hikari datasource which also provides the best of achieving connection pooling.We will discussing more on this in coming sections. Hibernate supports 2 different naming strategies.To use Hibernate 5 default naming strategy, we have used PhysicalNamingStrategyStandardImpl. Keep a note that SpringPhysicalNamingStrategy is the default naming strategy used by spring boot. In production, it is always recommended to use datasource that supports connection pooling because database connection creation is a slow process.Here in the example we will be using HikariDatasource instead. It provides many advanced features while configuring our datasource in comparison to other datasources such as connectionTimeout, idleTimeout, maxLifetime, connectionTestQuery, maximumPoolSize and very important one is leakDetectionThreshold.It is as advanced as detecting connection leaks by itself.It is also faster and lighter than other available datasource.Following is the configuration for HikariDatasource.Make sure you comment the datasource confguration in properties file. We can also create Hikaridatasource using DataSourceBuilder as follow.While doing so the datasource related properties can be still there in proerties file.I like this way. In this case, we need to explicitly tell spring boot to use our custom datasource while creating EntityManagerfactory.Following is a sample example. Spring boot focusses on using JPA to persist data in relational db and it has ability to create repository implementations automatically, at runtime, from a repository interface. But here we are trying to use hibernate as a JPA provider. Hence, following configuration is required to autowire sessionFactory in our DAO class. Following is the entity class. The class is annotated as hibernate entity. Let us define our controller. It has one url mapping that intercepts request at /list and returns all users present in db. Let us define the dao. We can also get hibernate session in following way using JPA entitymanager. But since this article is about spring boot and hibernate integration, we are injecting hibernate sessionfactory and getting session out of it. In next post we will be discussing about spring data with spring boot. Following are some sample DML. 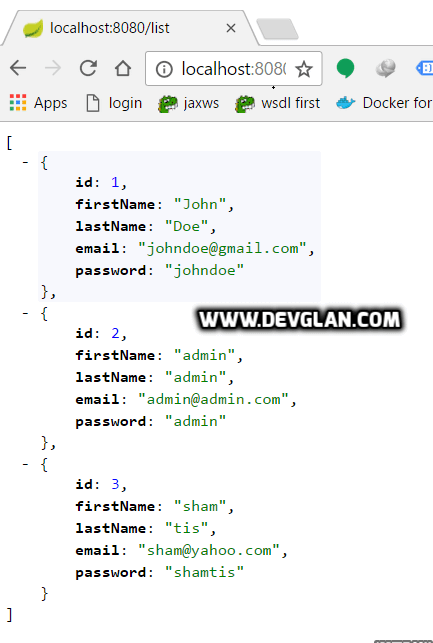 We will be creating some dummy user details using following insert statements. 1. Run Application.java as a java application. 2. Hit the url - http://localhost:8080/list. Following screen will appear. Above configurations runs perfectly fine with Spring boot 1.5 but it may fail for spring boot 2.0. After the release of spring boot 2.0, hibernate and datasource related configurations has been more easier and more efficient.Hikari datasource has been the default datasource and connection pooling provider and we don&apos;t require any explicit configuration to achieve that. Instead, we have to remove some dependencies from above configurations.We don't require commons-dbcp and HikariCP artifacts. With following entries only in application.properties, we can achieve hikari connection pooling. 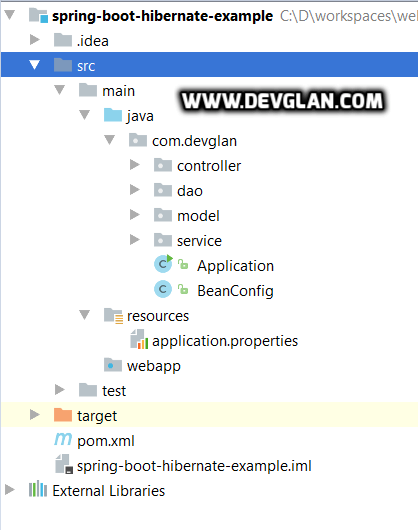 In this article we learned about integrating hibernate with spring boot application. If you have anything that you want to add or share then please share it below in the comment section.